The internal URL chrome://downloads that you may know from the desktop version of Chrome does not work. The only option to access the downloads in Chrome for Android is to select Menu and there the Downloads link. Previous versions of Chrome did not offer such a menu, but all recent versions of the web browser do. If you need to access a file that you downloaded, that is your best option to access it again using the browser. There is another option, and that is to use the file manager of Android instead to manage downloaded files. 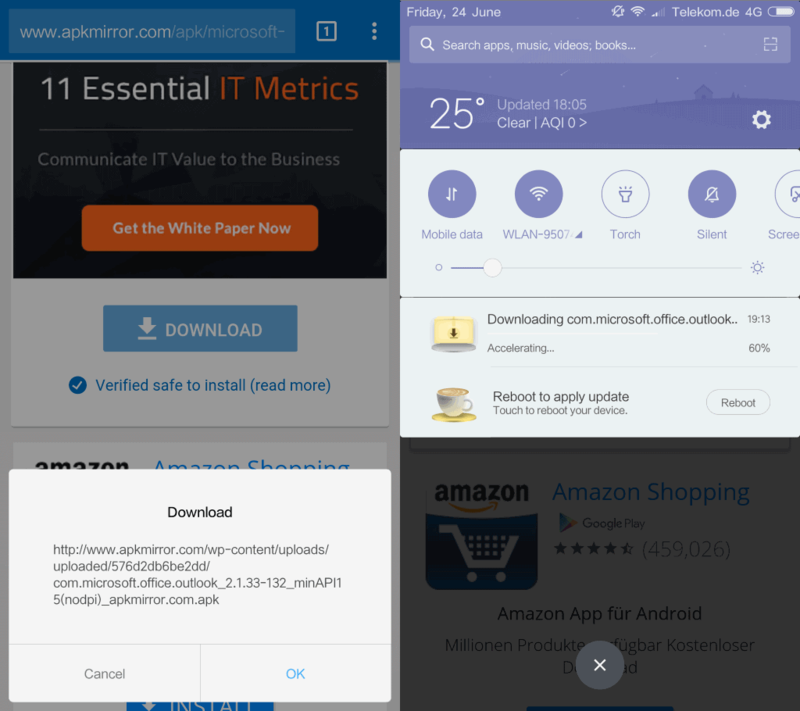 Chrome displays a download dialog when you tap on files in the mobile browser, and notifies you that the download has been added to the queue when you select the option to start the download. Chrome displays warnings for some file types, e.g. apk files. You get a "This type of file can harm your device" prompt that you need to accept with ok or deny with cancel to stop the download process. Recent versions of the web browser display a short confirmation that a file has been downloaded successfully. The confirmation goes away after a short period, and it may not be clear how to access the downloaded file. If you bring down the notifications area of the device, you will see the downloads listed there as a single entry. Another option that you have is to select Menu > Downloads to list all files downloaded previously. A tap on a single download listed there launches the file. What happens depends on the file. You get a prompt if the file is an apk or executable file for instance. Most files, media for instance, are opened in the default viewer application or a prompt is displayed what to do with that file type. Chrome's Download Manager on Android is bare bones. It sorts downloads by date and displays the filename, size, and root domain it was downloaded from in the interface. You may use the search to find files but won't find many other useful options there. A tap on a download launches it and a tap on the menu displays options to share the file or delete it. You may use the Files app on your Android device to manage downloaded files better. Just open it on your device, e.g. by swiping up and selecting Files from the list of available applications. Tap on the Menu icon in the top left corner and select Downloads to display only downloaded files. Here you may select the menu next to individual files to interact with them, e.g. to delete them, launch them, install an apk, or use open with to pick an app that is not the default to launch it that time. Long-tap on a single download to activate the selection mode. The screen changes indicating that you selected one file. Tap on other files you want to delete from the device, the file count will change. Select the trash icon to delete them all at once. Select Menu > Select All to select all downloads. Select the trash icon afterward to clear all downloads from the device. Some Android devices come with a Downloads app. Design and layout of the app depends largely on the manufacturer of the device. 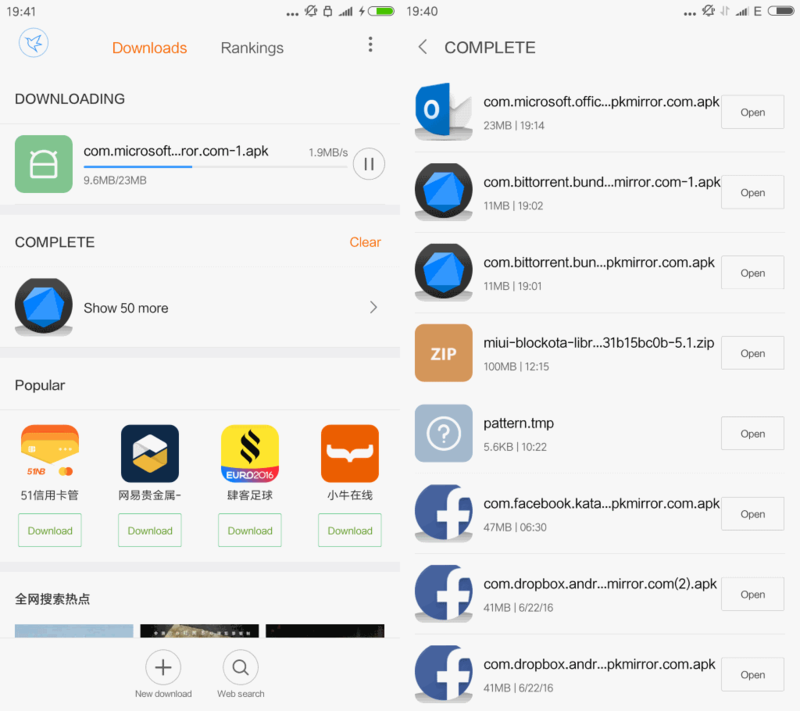 The download app on my Xiaomi Mi4c device for instance separates files that are downloading from complete files. You may pause or resume files that are in the download queue there for instance. or list all files previously downloaded to the device. 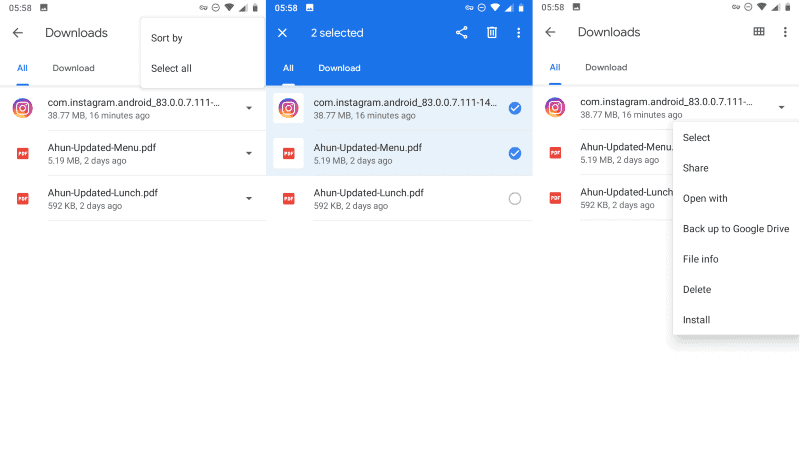 There you may also clear the list of downloads which just removes the reference to the download but not the actual file which remains on the device. You may use the file manager of the device instead to access all files downloaded to it. How that is done depends again on the device, but you should have access to a file browser (called Explorer or just Files). Use it to open the downloads folder on the device which lists all downloaded files that have not been deleted yet. Some browsers handle downloads internally. This is the case for the Firefox browser for instance which displays downloads when you load about:downloads, or select Menu > Tools > Downloads. Opera too is listing downloads directly within the web browser. One question that should come up is why Google does not list downloads in the browser itself. It could be a combination of downloads not being overly popular on mobile devices and keeping Chrome as clean and tidy as possible interface wise. Anyway, if you download on Android using Chrome for the first time, you know where to look now. 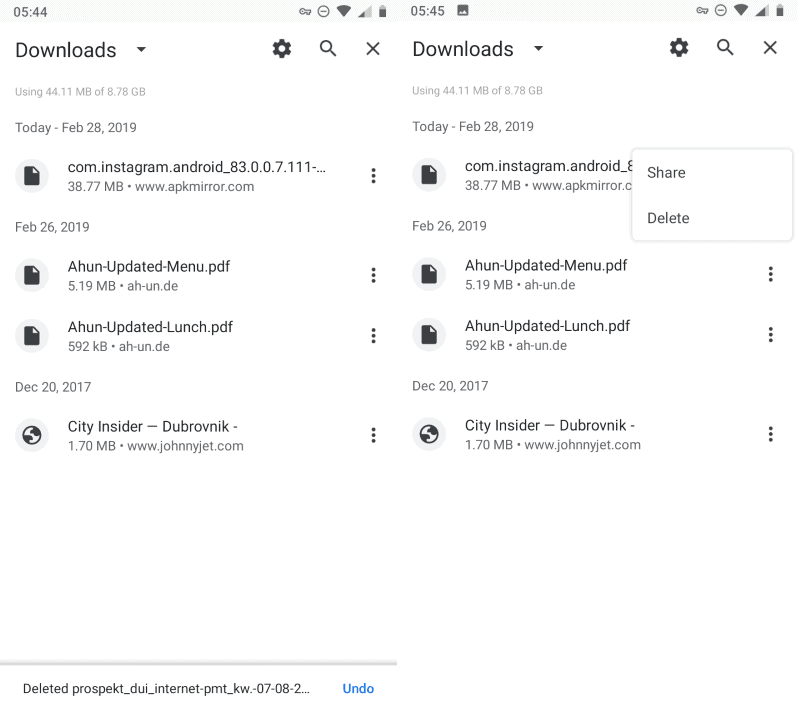 Find out how to manage files that you download from a network or the Internet on your Android device using the Google Chrome web browser. That’s it, sort and remove options, also tap to open. And share after you select a file or more. Not even search, let alone pause download, etc. I’d appreciate if it had a clear list button, but it doesn’t. And if you don’t move the file from Downloads folder it also deletes it when you remove the entry from downloads manager. The way I discovered this was a bit infuriating as I had to redownload some files.. Also no select all button, I have to tap on each file, all 100 of them if needed, to select then remove them. Google should reconsider their priorities.. Thank you so much buddy…. I forgot that I could control chrome downloads using my Default downloads app. Finally I could stop a large file from downloading on my mobile data. Thank you! I came here from a Google search after wondering if I was somehow going blind and missing the downloads options. I guess I’m just accustomed to Firefox and Opera Mini on Android, and desktop Chrome and Firefox that have a Downloads list built-in. i used to control from here but from last miui update im unable to see downloading tasks here. What if I DONT want downloads filename liseted in the CHROME browser at all? What if I DONT want downloaded filenames listed in the ANDROID CHROME browser at all? @jobo My question too, but Unfortunately, there’s no option to do it, unless clear the entire chrome data from phone’s app settings. Useless. There is no way to delete the list of downloads all at once, you have to delete each item one at a time. It takes forever. There is NO DELETE ALL option.